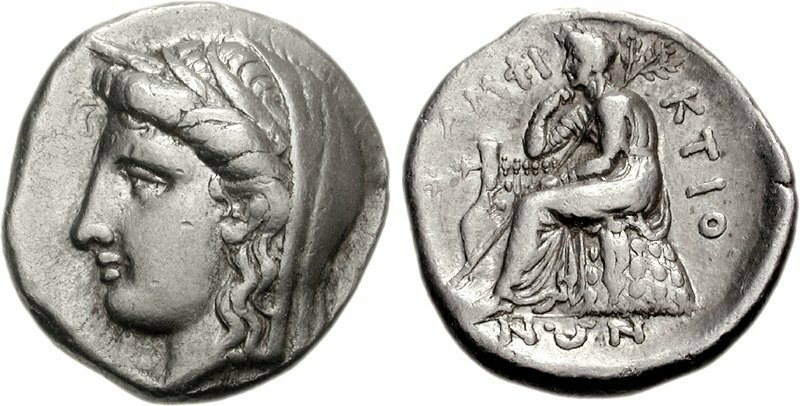 Notes: Sale: Triton XII, Lot: 231 Well struck on a broad flan In 373/2 BC, an earthquake destroyed the great Temple of Apollo at Delphi. Although reconstruction on the site commenced, the Phokian occupation of the sanctuary during the Sacred War of 355-346 BC prevented any full-scale work from occurring. In 338/6 BC, the Amphiktionic League decided to melt down the coinage comprising the temple treasury and mint a new series of coinage that would be used to finance a full reconstruction project. This new series comprised staters, drachms, and hemidrachms, whose types reflected the two sanctuaries controlled by the Amphiktionic League: the Temple of Apollo at Delphi and the Temple of Demeter at Anthela (near Thermopylai). The obverse of the staters depicts a left-facing head of Demeter, wearing a veil and grain-ear wreath and evoking her traditional guise as the goddess of grain and fertility. On the reverse, Apollo is seated in a contemplative manner on an omphalos, holding a laurel branch and resting his elbow on a kithara. The omphalos, kithara, and laurel branch each recall a significant aspect of Apollo’s mythology, with the omphalos signifying his oracular seat at Delphi, the kithara his dominion over music, and the laurel (ἡ Δ?ΦΝΗ) his personal badge, the result of his unrequited love for the nymph Daphne.